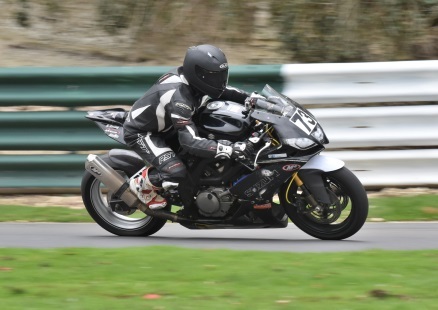 My first time back to Cadwell Park since my rookie season in 2013. I did some work on the bike since Silverstone in an attempt to rectify the overheating problem and I had cured the leak but the engine is still overheating. It was quite dramatic, I saw the gauge reading 110 degrees mid race. Saturday was torrential rain all day and most of the night, the grass paddock turned into a mud patch very quickly and racing was a bit sketchy especially when traversing the many rivers that were running across the track especially on the start/finish straight and in the dip on the park straight. I qualified in 14th with a time of 2:16.779. I didn’t expect much more as I didn’t do the Friday practice and as I have already said I hadn’t been to this track for five years. I lined up for Race 1 with the main goal of finishing the race and ensuring I got to the second and subsequent races with breaking me or the bike. We started and were soon stopped with a red flag for a bike stranded in the track. We waited and lined up again for a second restart. We managed to complete the five lap race but out of 31 competitors only 21 stayed up right to be classified in the results. I finished 9th with a time of 2:09.302, so making progress. Race 2 was more of the same, in fact the rain was harder and the standing water had increased. I started in 13th, start places are based on fastest lap times from the previous race, and had some good battles. I managed to make progress forward which was a bonus as my goal was to stay on at all costs but this helped to give me a good start place for the first Sunday race. This time I finished in 11th with a fastest time of 2:06.545. Race 3. Sunday produced some much better weather. It was still very cold but no longer raining. The first race was on a damp track, a lot of people went out on dry tyres but I opted for a wet front just for a bit of extra confidence. I started this race in 14th from the 5th row of the grid and again found myself in the same mid field battles. I finished this race in 11th with a fastest time of 1:51.419, a new personal best. Race 4. I started in 13th and the track was now dry. I went out with the goal of beating my PB and giving those around me a good race. The weather was the best it had been all weekend and the bike had felt planted, even in the extreme wet conditions of Saturday. I finished this one in 9th with a fastest, and new personal best time of, 1:48.490. The bike still has problems for me to work on, after the first race on Sunday I was called into the dyno, although the bike felt great the dyno result showed its only producing 70hp, that’s less than a minitwin!